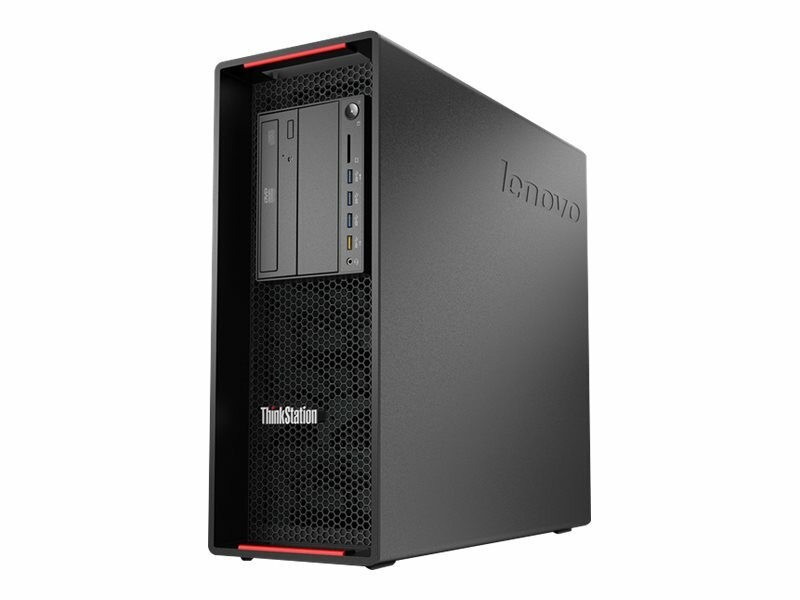 A next-generation mainstream workstation that’s powerful enough for any job and reliable enough for mission-critical environments, the Lenovo ThinkStation P510 is scalable, flexible, and gives you the power, performance and usability you need. Superior design features include Flex Trays that hold up to two drives for total flexibility and patented Tri-Channel Cooling for enhanced reliability. 16GB (2x8GB) 2400MHz Registered (RDIMM) ECC DDR4, expandable up to 256GB. There are eight 4-channel capable DIMM slots. Two slots contain removable 8GB modules; the others are available. 8GB dedicated VRAM with nVidia Quadro M4000 graphics. Genuine Windows 7 Professional 64-bit Edition is pre-installed, available through downgrade rights in Windows 10 Pro. (4) 3.5” storage bays, support for one 3.5” or 2.5” drive per bay. (2) 5.25” Flex bays for half-height optical drives or up to one optional Flex module (Flex modules support one or more of the following options: 9.5mm optical/29-in-1 USB 3.0 reader/front IEEE 1394/front eSATA) or up to two storage bays for 3.5” or 2.5” SATA drives. (1) Flex connector, supports up to one LSI RAID flex adapter for SATA/SAS RAID or up to one Multi-I/O flex adapter for one 2.5” PCIe SSD or up to one M.2 flex adapter for one M.2 PCIe SSD. (2) IEEE 1394 (one on rear and one on optional front Flex module) via PCIe adapter, up to one adapter per system. (2) USB 3.0 at rear per optional PCIe adapter, up to three adapters per system. (1) Thunderbolt at rear via optional PCIe adapter. (1) eSATA at front (on optional Flex module), or one rear eSATA via optional cable (also needs one PCIe slot), up to one eSATA port per system. (1) USB 3.0 internal port via optional cable, cannot be intermixed with 29-in-1 reader. Onboard SATA controller in chipset, SATA 6Gb/s, supports RAID 0/1/5/10. (1) Integrated Gigabit Ethernet (Intel i218LM), supports Wake-on-LAN. Optional discrete Ethernet adapters available.